The retreat was a gift to the senior class as it allowed them to bond and see things that they wouldn’t have been able to see in an academic setting. “Being all together, away from our campus takes people out of those labeled boxes, like being a cheerleader or student council rep,” said Ms. Barbakow. Ms. Barbakow wanted give the senior class a similar experience that allowed for further bonding, but where each senior could also become introspective and reflective of their own selves. 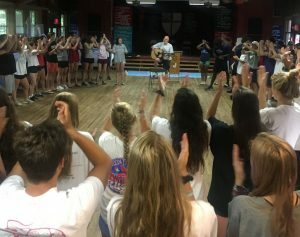 From singing songs to playing charades to predicting our 10-year reunion, the senior class spent the first two days doing a variety of activities. “I loved the trip,” said senior Kayla Ross. “We did a lot of team bonding activities that made us a lot closer as a class. I got closer to people I didn’t expect and made deeper connections with friends and teachers.” Favorite activities were the charades night and the parent letter. On the first night, the seniors were split into two groups, and they were prompted to create a moment that was special to the class as a whole. Some recreated memorable moments from Spirit Week, and others, from Music Midtown. The retreat would not have happened without Ms. Barbakow, Administrative Assistant for Student Life Bowen Eagleson and a team of helpers: friend and mentor Father Mike Wallens and seniors Max Creasman, Paige Fleming, Merritt Ann Glass, Lane Goldman, Abigail Lund, Emily Pulver, Jacob Sloman and Raina Williams. “We met a few times in the spring and then again before the retreat,” said Pulver. “We just all threw out ideas. Like, I suggested the banner.” The banner hangs outside of Ms. Barbakow’s office on the fourth floor and reads “Class of 2019.” Scattered around the lettering are messages and quotes written by the senior class. “Some are inspirational quotes, others are just funny messages that [the seniors] love,” said Pulver.